Blocks are a great gift for babies, since they love learning how to stack and organize them. There are oodles of building block sets out there, most of which offer the ABC basics. But this set of periodic table blocks that pushes the envelope beyond child’s play is a real breath of fresh air (or shall we say O?) that will take your tot’s learning up a notch and keep her busy beyond the baby years. Made in Michigan with Basswood from the Great Lakes Area and printed with non-toxic inks, the 20 block set covers the 118 elements of the periodic table in bright, candy colors. Each of the six sides features an element’s name, atomic number and symbol. Your little one may be years away from experimenting in the chemistry lab, but identifying the basics with these blocks will surely spark some serious playtime fun now. Blocks are a great gift for babies, since they love learning how to stack and organize them. There are oodles of building block sets out there, most of which offer the ABC basics. But this set of periodic table blocks that pushes the envelope beyond child's play is a real breath of fresh air (or shall we say O?) that will take your tot's learning up a notch and keep her busy beyond the baby years. Made in Michigan with Basswood from the Great Lakes Area and printed with non-toxic inks, the 20 block set covers the 118 elements of the periodic table in bright, candy colors. Each of the six sides features an element's name, atomic number and symbol. 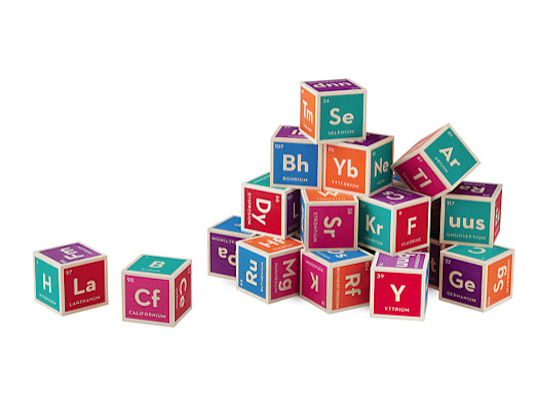 Your little one may be years away from experimenting in the chemistry lab, but identifying the basics with these blocks will surely spark some serious playtime fun now.